Hey Wyrdos! GenCon is past, but we still have lots of cool things to show off! We are taking another look at one of the Titans. This week we are looking at the King's Hand the titan of the King's Empire. A King's Hand is one of the massive war-constructs in service to the Crown. Initially commissioned when England was more fully under the Guild's thumb, the King's Empire commandeered and renamed the colossal machines when it banished the Guild from its shores. While this resulted in significant tensions with the Guild, in the eyes of the Empire, the risk was more than worth it. Dubbed the King's Hands, these massive Titans take advantage of efficient Guild engineering and the most advanced British firepower that money can buy. These warmachines were further tweaked with the help of the Abyssinian engineer, Kassa Okoye, pushing them well beyond the Guild's slated operational parameters. Outfitted with high-level targeting optics, a massive Gatling gun, and layers of armor, a King's Hand is capable of wading into and dominating almost any battlefield. 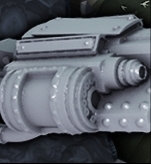 Because the Empire's Titans focus on largescale firearms, they are able to hang back from the front lines, allowing to better weather each individual battle with minimal repairs. Although not yet widely deployed due to limited numbers, the King's Empire has doubled their production capacity on these Titans, as the Battle of London has proved their necessity in this brave new world of warfare. 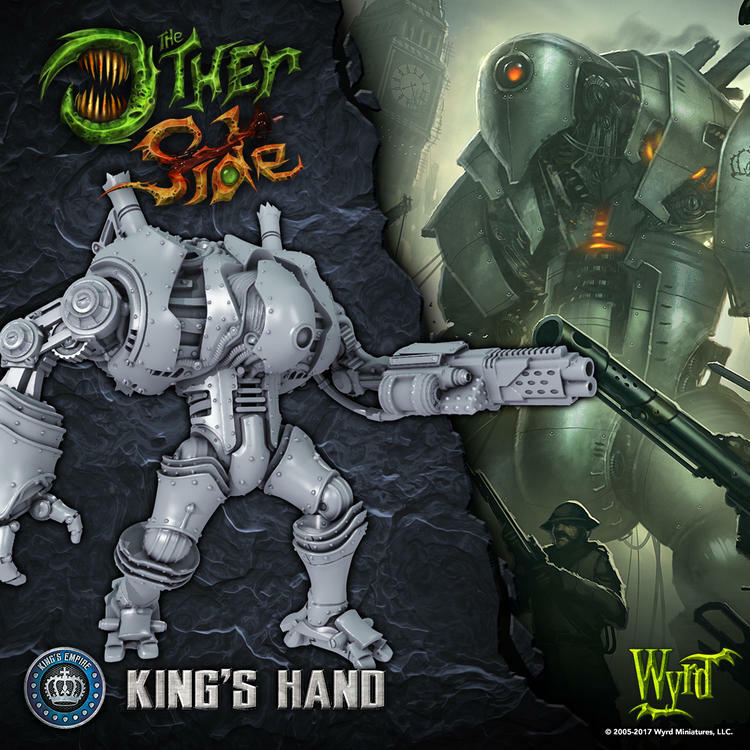 On the tabletop, a King's Hand is a long-range Titan. It can deal good damage at range, and with the right Assets, can put a severe dent into enemy forces. A King's Hand is a relatively straightforward weapon, and it is best used as such. Because of its high Strength weapons, a King's Hand can often cut down enemy Titans at long range. Alternatively, the King's Hand can take advantage of its Targeting Parameters by firing into engagements, killing any enemy Fireteams in order to allow its allies to escape the battle and fall back to more defensible positions. She can borrow Squads only sadly, so the Hand stays in the Empire. You can play her as Empire and bring the Mech Infantry or Steel Legion there with her though! Its not a gatling gun though? The definition of which is a weapon with multiple rotating barrels. Pointless pedantry aside though, it looks pretty cool. Robot stomp! Cult Of The Burning Man sold itself to me instantly on visuals alone....this guy sold me the opposition...fantastic looking model that will doubtless spawn a thousand paintjobs...is there a "walks through buildings" attack available ?... because it looks as though it could properly wreck some scenery....any info on the rough height of the actual model ? Not an attack, but Titans can ignore some terrain. There are pictures of him at GenCon standing next to normal models, but alas, I don't remember his actual height.